Of the old postcards from the collection stored until recently in the basement of Wack’s Drug Store, none perhaps has as much artistic beauty and interest as the first picture illustrating today’s column, showing the old Waterloo Mill, on Darby Creek. The second postcard, which has been lent by the William Henry Roberts family, is equally artistic, with its view of Old Eagle School road in Strafford. 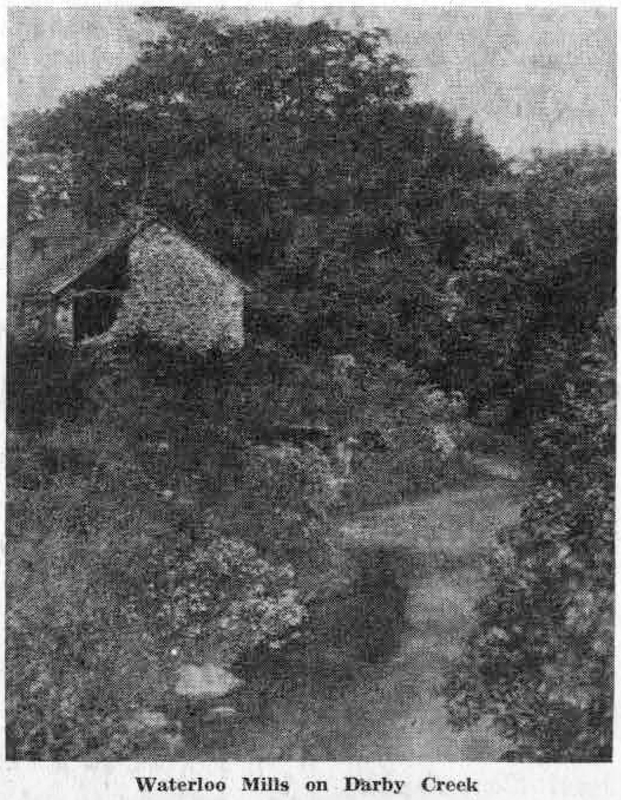 In an effort to find out whether the remains of the old mill are still in existence, your columnist consulted Albert N. Curley, who gave a talk on “The Old Mills of Radnor” at the November meeting of the Radnor Historical Society during the summer of 1954. Mr. Curley and the boys of his Scout Troop had tramped the banks of Darby, Little Darby and Ithan Creeks in order to explore the sites of the mills and the homes of the early settlers. In reply, Mr. Curley wrote that in following Darby Creek, he and his scouts did not trace it as far as Cabbagetown and therefore he had no information on Waterloo Mills. If any of our readers possess such information, or if they have other pictures of the old mill, it would be interesting to use both information and pictures later on in this column. 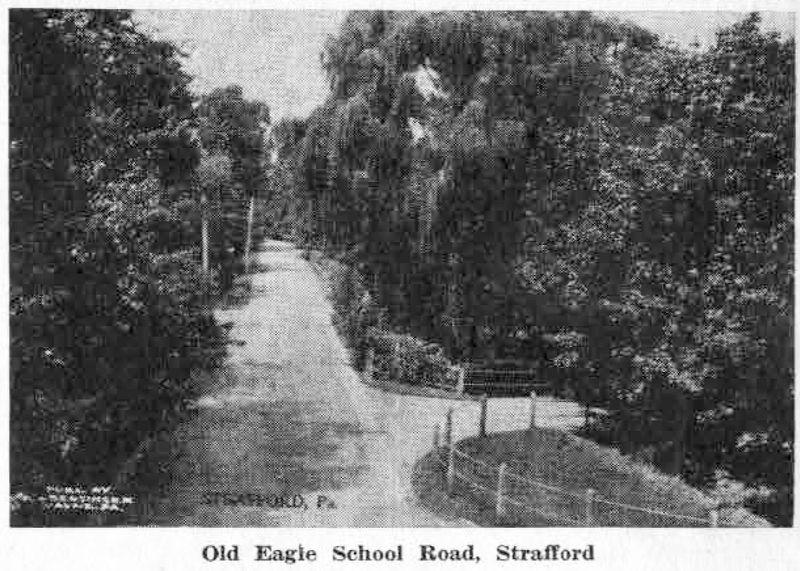 Although this postcard bears only the caption, “Strafford, Pa.,” the picture is obviously one of Old Eagle School road as it makes its way north of the overpass of the Pennsylvania Railroad. It was undoubtedly from this overpass that the photographer took his picture 40 or more years ago. Just out of sight, in the lower right hand corner of the postcard, is the shelter station on the north side of the railroad tracks, while the road on the right is Crestline road. The once neatly fenced-in grass plot shown in the picture, just this side of Crestline road, is now no longer either a grass plot nor fenced-in, since it has become the parking lot for those who leave their cars at Strafford station. There are few roads in this entire section that have been travelled for as long as Old Eagle School road, which takes its name from the quaint little building erected about 1767 by early German settlers for church and school purposes. The present building, so carefully preserved and tended, has a stone marker in its south gable, inscribed 1788. This stone supposedly belonged to a second building which was erected close to the first. Later on, the two buildings were apparently made into one. Surrounded by its neatly kept grounds and adjacent to the old graveyard, where “the great trees spring as often from the graves themselves as from the ground between,” the building is now under the supervision of seven trustees appointed by the court. In this picture the old school could almost be seen up the hill, on the right side of the road, were it not for the great overhanging trees. To the present day spectator watching the never ending flow of passenger automobiles and of trucks going so rapidly in both directions under the railroad underpass, it seems a far cry indeed to the days when the traffic on this same road consisted of desultory farm carts drawn by oxen. Their owners, driving along the narrow dirt road through the forest, were usually on their way to or from the little German settlement that sprang up in the middle 1700’s around the first small Spread Eagle Inn. That was even before the days of the second and more pretentious inn of the same name, and of the stone turnpike which, when it was completed in 1794, was the first of its kind in the entire United States. Even in the earliest days of the turnpike, community life, simple as it was, centered around the inn. Later the second hostelry became the stopping place for the stage, and indeed the last relay station eastward on the turnpike. The mail, too, was left there. And around the inn, which was situated on the north side of the turnpike just to the west of the present Spread Eagle Apartments, there grew up the blacksmith and the wheelwright shops as well as the cobbler’s. And so, to provide for these simple needs, these early German settlers of 200 years ago travelled back and forth along the narrow dirt road which, in its present widened and paved state, is still called by the first name given it, Old Eagle School Road. 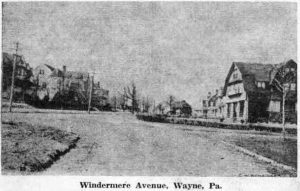 The pictures of Windermere avenue and of Aberdeen avenue have been lent by members of the Roberts family who came to live in Wayne in 1900. In that year Dr. William Henry Roberts, who was Stated Clerk of the General Assembly of the Presbyterian Church in the United States for 36 years, settled in Wayne with his family in one of the Wayne Estate houses on Windermere avenue. The home, which is still occupied by several members of his family, is one of those that is just barely visible on the left hand side of the street in the picture. Both of these pictures were taken from the intersection of Windermere avenue and South Aberdeen avenue, the first one looking west along Windermere avenue and the second looking south along Aberdeen avenue with Upland way taking off to the right. Although the houses are all little changed from then to the present time, the general appearance of the streets is quite different due to the growth of trees and hedges. This third picture, which is from the Wack collection, is taken from the corner just a block east of the corner from which the first two were taken. For some now obscure reason, Windermere avenue as it goes east becomes St. Davids road after it passes Aberdeen avenue. 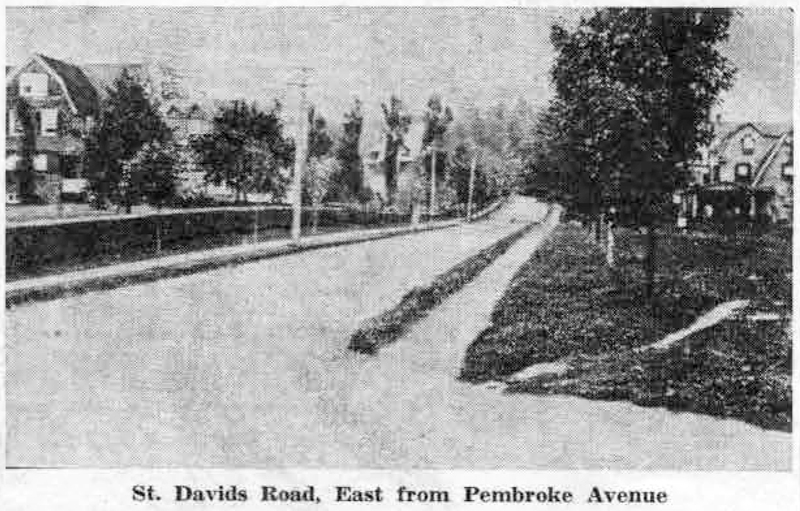 This picture, looking east along St.Davids road from Pembroke avenue, shows the houses looking again then very much as they do today. 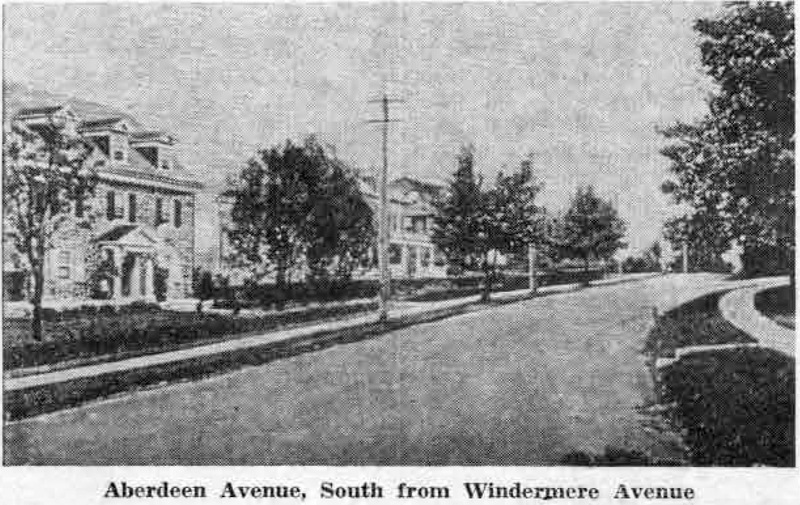 The southeast corner was evidently a vacant lot at the time indicating that the homes later built and occupied by George W. Pepper, Jr., and Sheldon Catlin had not yet been constructed. 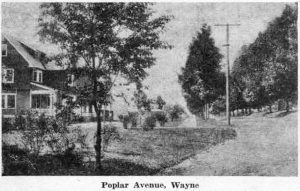 This picture of Poplar avenue is one looking west from its intersection with Radnor road. The old John P. Wood homestead, the grounds of which went from Walnut avenue to Poplar avenue on Radnor road, is just out of sight in the right hand corner of the picture. And although this picture was taken at least 45 years ago, the street still looks very much the same except that the stretch of vacant land on the left hand side of Poplar avenue is now occupied by houses. In the December 7 and 14 issues of this column reproductions of old postcard pictures were used as illustrations. These postcards were from a collection salvaged by Dr. Norman Wack from the cellar of his drugstore several weeks ago. The first picture in today’s column is from that same collection of old postcards. According to the caption it is the “Spring-Gail Swimming Pool, Edgewood Lake, St. Davids.” Back in the 1880’s it was called Fenimore’s Dam, from the well-known Fenimore family, which owned much acreage in that part of St. Davids. Although it is now part of the property of Eastern Baptist College, it is still the Walton pond to many residents who have spent pleasant hours in summer swimming in its water, and in Winter skating on its frozen surface. Before the big mansion home and its surrounding acreage was sold to the college it was the property of the Charles S. Walton estate. 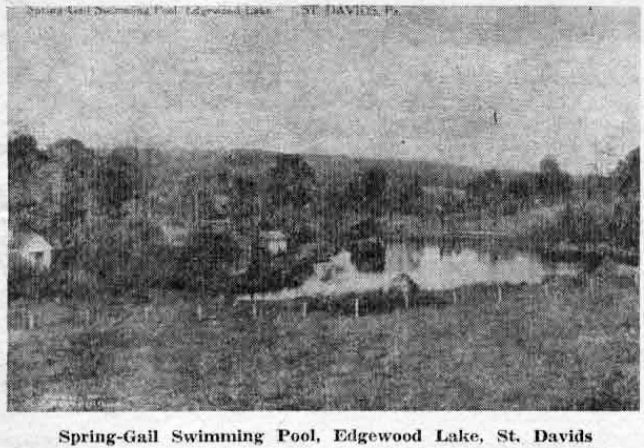 In this picture, the small building in the center shows a pumping station of the Pennsylvania Railroad, which was located at this pond, manned by “Billy Pump,” whom many remember as general custodian of the Walton pond for many years. 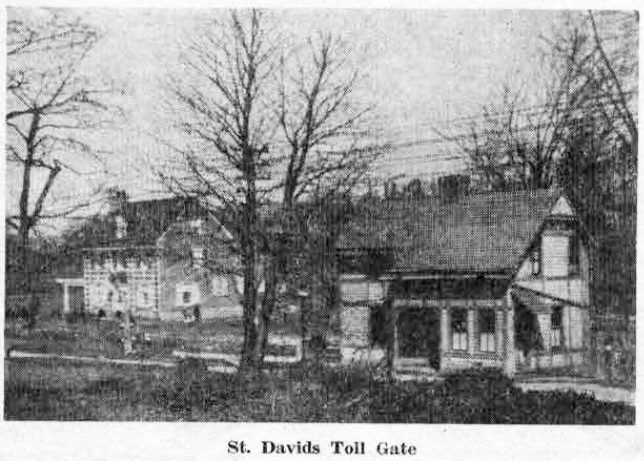 For this picture of St. Davids toll gate the writer is indebted to DeBourg Tees, of East Lancaster avenue, St. Davids. It was taken by him in 1912, not long before the toll house was demolished. Standing near the western boundary of what is now the Main Line Golf Club, this was the last of the local toll gates to be in operation on the Old Lancaster pike. Among the present residents of this section there are still those who can remember paying toll from a horse-drawn vehicle. And some, perhaps, who were small fry then, can remember circuitous routes they took on their bicycles to avoid the payment of a few pennies toll. The residence just to the left of the toll house is now the home of Mr and Mrs. H. Raymond Dahm. In the background are some of the first houses to be built in St. Davids Court. It might be difficult to convince a newcomer to Wayne that the entrance to one of Wayne’s smartest dress shops once looked like this! Nevertheless the picture above shows the original appearance of the steps and doorway leading to the present Natalie Collett shop, on the northeast corner of Lancaster avenue and North Wayne avenue. When originally built in the early 1870’s on ground donated by Henry Askin, one of Wayne’s early residents, this building was known as the Lyceum. It was then used for lectures and debates. Later it was called the Wayne Opera House, where many concerts and amateur theatrical performances were held. 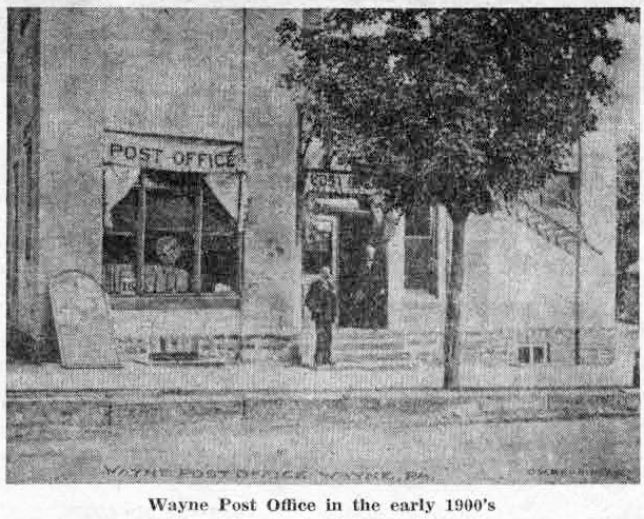 When this picture was taken the entire western end of the first floor of the building was occupied by the Wayne Postoffice. In 1914 much of the interior of the old Opera House, including the Postoffice, was burned out in one of Wayne’s most disastrous fires. However, all parts of it were quickly restored. In its present state the Colonial Building, as it is now called, is the result of a complete renovation plan of Main Line Investments Company, Inc., in 1950-51. Although this postcard picture is not dated, it must have been taken before the fire, probably in the early 1900’s. The man at the left has been identified by several old timers as A.A.H. Canizares, and the man at the right, may be Postmaster Brown.